Santa was good this year and brought you a bunch of new, fuzzy, warm sweaters. The label inside your sweater is your best guide for safely washing it. By now, they've been worn a few times and need a date with the washing machine. But you hold back, not wanting to lose that new look and feel. 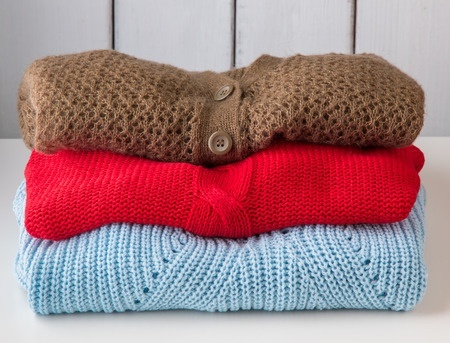 Believe it or not, sweaters can survive the laundering process - and even come out looking good. You just have to know how to sweater wash by fabric type. First of all - just because dry cleaning is expensive does not men it's the best care for all sweaters. The dry cleaning chemicals can build up on some fibers and leave them stiff. Probably not the look you're going for. Here's how to sweater wash yourself, safely at home. Your first act before undertaking a sweater wash: Read the label. Then follow the instructions very, very carefully. Sweaters are a little harder to care for than most garments. They can shrink; they can stretch; they can pill. And the softer the sweater, the more delicate. Acrylic sweaters: Acrylics are manmade fibers that can stretch when subjected to heat. Wash as directed on the label (usually in warm water). Then either lay the sweater flat to dry or tumble dry on low if the label says that's OK. If you have to iron it, iron it inside out on low heat and be careful not to stretch it. Angora sweaters: Angora sweaters are a blend of rabbit hair and synthetic fibers. It's very prone to shrinking so this is one you should consider dry cleaning. If the label says it can be washed, don't put it in the machine. Instead, hand wash it in a gentle laundry detergent and lay flat to dry. How to wash cashmere sweaters: Cashmere is usually goat hair blended with wool or synthetic fibers. Usually, you can wash cashmere on the delicate cycle in cold water. Roll in a towel to squeeze out excess water, reshape and flat dry away from sunlight or direct heat. Chenille sweaters: If you want chenille sweaters to stay soft, don't put them in the washing machine - even if the label says it's OK. The rubbing caused by the machine agitation can damage the fibers and make them snag or feel rough. Instead, wash inside out by hand, and lay flat to dry. Cotton sweaters: Usually, you can hand or machine wash cotton sweaters in cool water. Lay flat to dry. It may need ironing. Silk sweaters: Some silk sweaters can be washed in the delicate cycle in cold water and flat dried. But they may need ironing afterward. Wool sweaters: Some wool sweaters can be washed; others cannot. Check the label. If you do put it in the washing machine, use the gentlest cycle and wash in cool water. Don't twist. Lay flat to dry. Also, not all wools are alike. Shetland and Merino wools often can be washed in cold water on the most delicate cycle. Agitation can cause them to shrink. Always turn sweaters inside out to reduce pilling. (Those little fuzzy balls or bits of fluff that show up on the surface are called "pills", and are the result of fiber agitation in the washing machine, which can cause them to break). Wash sweaters in extra-large mesh bags. If handwashing, remove excess moisture by rolling the sweater in a towel. Machine drying: If you do put your sweater in the dryer, dry on low heat and remove it when it's almost dry. Let it finish drying flat on a rack. Storage: Never put away a sweater dirty. This makes it more attractive to pests. Also, some stains may set. Once a sweater is clean, fold to store it - don't hang. Hanging causes most sweaters to stretch out of shape. To make sweaters last longer, air them out at least 24 hours after wearing. Fold and store out of direct light.